During this season of thanksgiving, all of us at Mt. 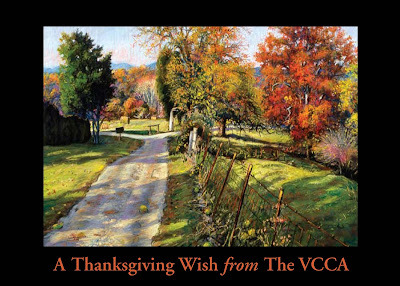 San Angelo are grateful for your continued support of the VCCA.We wish for you a harvest of hope and possibility this year and always. Image Credit: VCCA Fellow Daniel Hauben painted Osage in Autumn I during a VCCA residency in 2003, depicting one of several osage orange trees at Mt. San Angelo. Osage in Autumn I, 19” x 25” pastel on paper, 2003. This Just In: Kathy Anderson's short story, "You Are the Bad Smell," has been nominated for a 2008 Pushcart Prize by Apple Valley Review, which also awarded her its Editor's Prize this year. To read Kathy's award-winning story, click here. Kathy's plays have been produced in New York, Philadelphia and Arizona. Her new play "The Meatpackers Book Club" will have its world premier in May 2009 at the Philadelphia Theatre Workshop. Congratulations Kathy! Don't forget to join your fellow Fellows for our annual reunion tomorrow night, from 6 to 8 p.m. at the National Arts Club in New York City. There will be a special presentation of the VCCA Award for Excellence in the Arts to playwright Kia Corthron. The National Arts Club is located at 15 Gramercy Park South, New York City. Call (212) 475-3424 or click here for more information. Please note that the there is a strict dress code at the NAC and no denim is allowed.